Researchers from The University of Queensland, Central Queensland University and Wollongong University made the discovery while investigating rapid climate change and its catastrophic impacts in the remote Kimberley region of northwest Australia. Their findings were published last month (November) in the American Geophysical Union Journal. Associate Professor Hamish McGowan from UQ's School of Geography, Planning and Environmental Management said the studies in the north west Kimberley have shown there was a rapid change in climate around 5500 years ago. "This seems to coincide with the collapse of one culture until the climate adjusted to a level similar to what we see today and another took its place," Associate Professor McGowan said. The region is home to one of the world's largest collections of rock art with two distinctive styles known as Gwion (Bradshaw) and Wandjina. 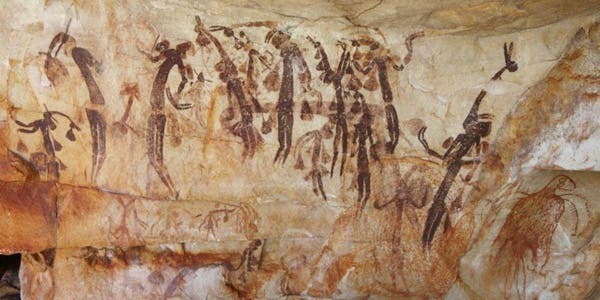 The Gwion paintings date back at least 17,000 years, with the most recent extending to around 7000 years ago, while the Wandjina paintings start around 4000 years ago and continue to this day. Until now the gap before the first Wandjina rock art appeared was unexplained. "Our research shows that the likely reason for the demise of the Gwion artists was a mega-drought spanning approximately 1500 years, brought on by changing climate conditions that caused the collapse of the Australian summer monsoon," Associate Professor McGowan said. He said a number of factors appear to have amplified the effects of the drought, such as a change in land surface condition and an increase in dust particles in the atmosphere, which caused a weakening or failure of monsoon rains. "This confirms that pre-historic aboriginal cultures experienced catastrophic upheaval due to rapid natural climate variability, and current abundant seasonal water supplies may fail again if significant changes to the climate occur," he said. Following the mega-drought, Wandjina painters appear to have moved into the area when the climate again became more favourable about 4000 years ago. Associate Professor McGowan said this research supports studies conducted elsewhere in Australia that show rapid changes in climate underpinned environmental stresses on prehistory Aboriginal populations.